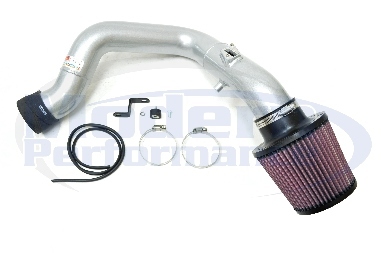 Includes all parts for installation including the optional use Drycharger filter cover. Dyno testing has given 8 hp and 7ft. tq to the wheels! This intake is fairly quite with light to moderate throttle, but nail the gas, and the you can hear the supercharger whine! Sounds GREAT ! Available in painted silver finish only. Some of the photos showing the intake installed are of a polished prototype intake K&N sent us to test.